We all know that life happens and sometimes its hard to clean up the clutter that has accumulated in life. Whether it be items that you have held on to meaning to donate or clutter that you want to toss. With everything that is going on with work, the kids, and making sure everyone is fed. The daily hassles of life can get in the way of getting daily cleaning tasks accomplished. Everything can feel very overwhelming with the clutter building up around you and life going by day to day. Its time to break it up in your routine and clean the clutter out of your life. We will help you one step at a time and together we can do this. 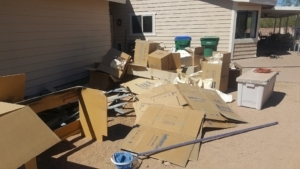 With Vista Clean Junk Removal all you do is go through your home, take out the clutter or the junk that you want removed, and place it outside. Depending on the size of the item, it may be to large for you to place outside the home. Our men can come into your home with booties on their feet and remove the item for you. When we arrive we will remove all the clutter from in or outside the home. We want to make sure you feel like you are getting things done in your home and life. It is important to feel in control of how your life is going and a big part of that is making sure your home is clean. With Vista Clean Junk Removal we are there to help the home owner with their home clean out. We can’t wait for you to feel stress free and relaxed today. Whether you are doing a small clean out in your home, or a bigger project we are there for you to count on.